This is the perfect dish for a wintry Sunday dinner. It can be made a few hours ahead, and will perfume the house with the aroma of red wine and bay leaves. Like most stews, it can be made a day or two ahead as well, and freezes well. 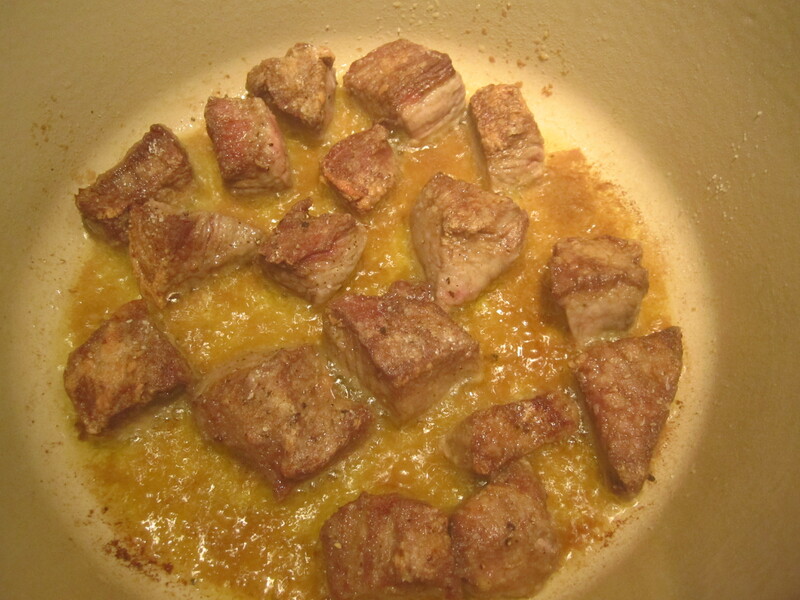 Cubes of beef chuck are dredged in flour and browned in olive oil. 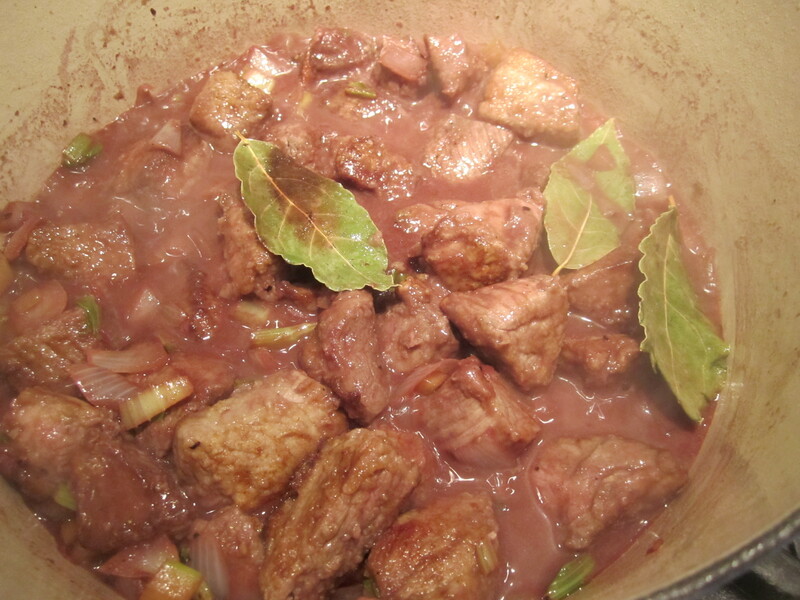 Celery, onions and bay leaves are then sauteed, then red wine and broth are added. The stew simmers partially covered for about two hours. You can either add carrots and potatoes to the stew during the last 45 minutes, or you can boil them separately and serve them alongside the stew. I prefer the latter, since the vegetables retain their own flavors and colors when they’re boiled separately from the stew. Besides, I like to shred the leftover stew and serve it over pasta. This works better if there is only meat, without extraneous potatoes and carrots, in the stew. 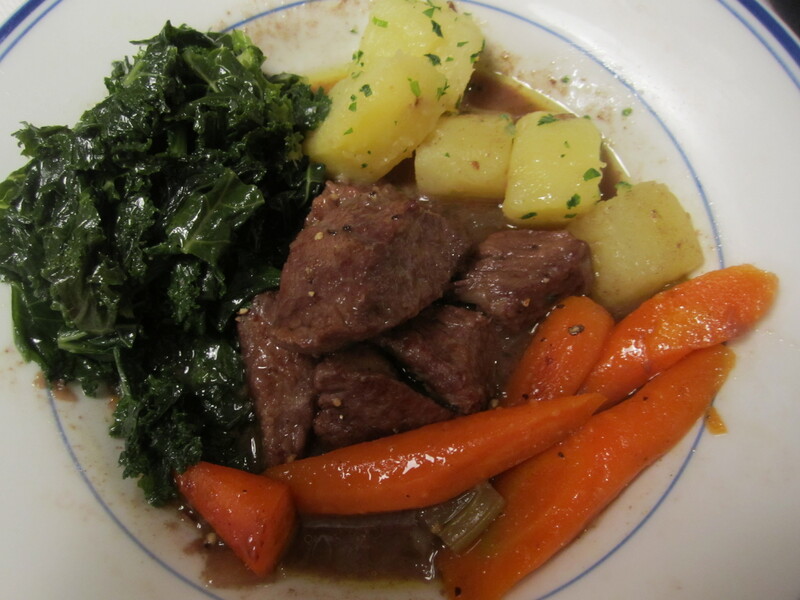 I served the stew with boiled carrots, potatoes and sauteed kale. All that was necessary was plenty of warm bread to soak up the magnificent brown sauce that forms the base of this stew. Heat olive oil in a dutch oven on high heat. 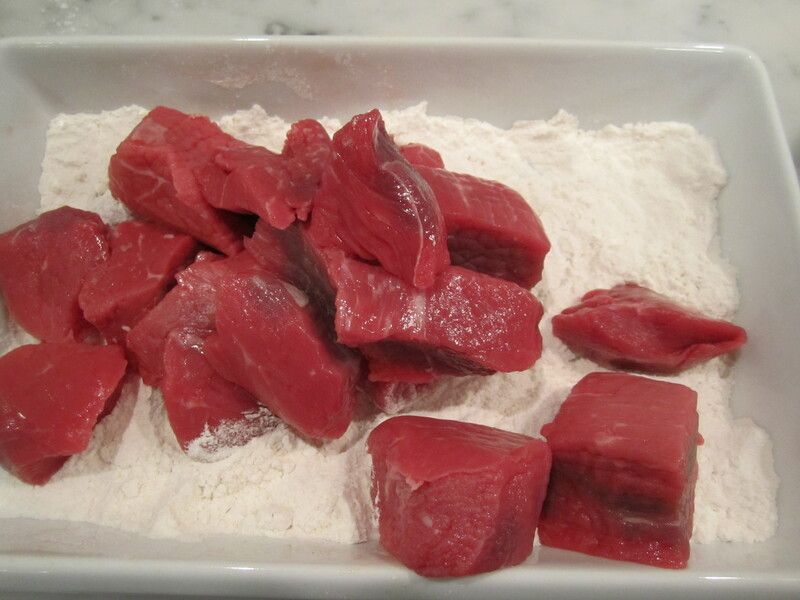 Sprinkle meat with salt and dredge cubes in flour. Shake off excess flour and place meat in hot oil. Brown on all sides over medium heat (about 8 minutes total). Work in batches, if necessary and set meat aside. 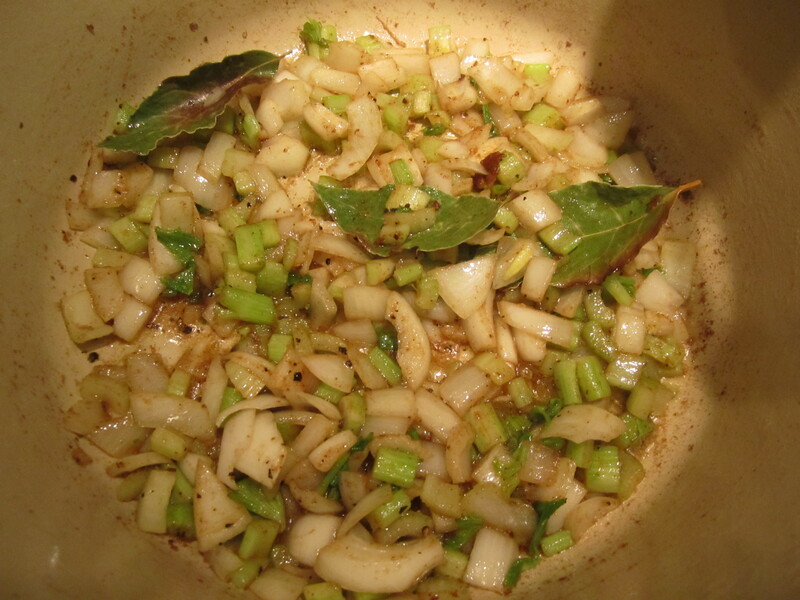 Add onions, celery and bay leaves and reduce heat to medium low. Stir to release brown bits from bottom and sides of pot. Saute for about 8 minutes or until translucent. Turn heat to high, then add wine and reduce for 2 minutes. Add broth and turn heat to low. Simmer, partially covered for 2 hours. Add salt and pepper (I like it peppery). Boil potatoes and carrots separately, then toss with butter and parsley and serve with stew, if desired. This entry was posted in Soup/Stew. Bookmark the permalink.